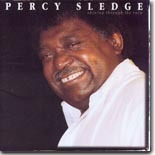 Legendary soul singer Percy Sledge has released a stunning new release, Shining Through The Rain. It's this issue's Pick Hit. We take it into the swamps for this month's Surprise pick, highlighting guitarist Sonny Landreth's new live album, Grant Street. One of the hottest Louisiana anthologies is the 1990 Black Top compilation Gulf Coast Blues, featuring great cuts from the likes of Carol Fran & Clarence Hollimon, Joe "Guitar Hughes, Teddy Reynolds, Grady Gaines, and more. It's this month's Flashback. This month's What's New section features new releases from Solomon Burke, Denise LaSalle, Lee "Shot" Williams, Bruce Katz, Harry Manx, Tom Jones & Jools Holland (yes, THAT Tom Jones), Sugar Ray and the Bluetones, Ronnie Earl and Duke Robillard, Jimbo Mathus, Chris Cotton, and more.